One level of terracing completed. The other(s) may have to wait until next year. Our Scarborough Fair herb lineup: parsley, sage, rosemary and thyme, plus others. We don’t have much room here in the country. Since we want to grow as much of our own food as we can we need to be a little clever. One of the best areas we have is on the north side of the house. It is almost completely free of shade and since the driveway goes down that side to the garage it is less used than the south side yard. when the sun is out. One part of it we planted about three weeks ago when we removed a very overgrown rose. Luckily the rose had killed everything underneath it. Unluckily we had to dig the rose root out. 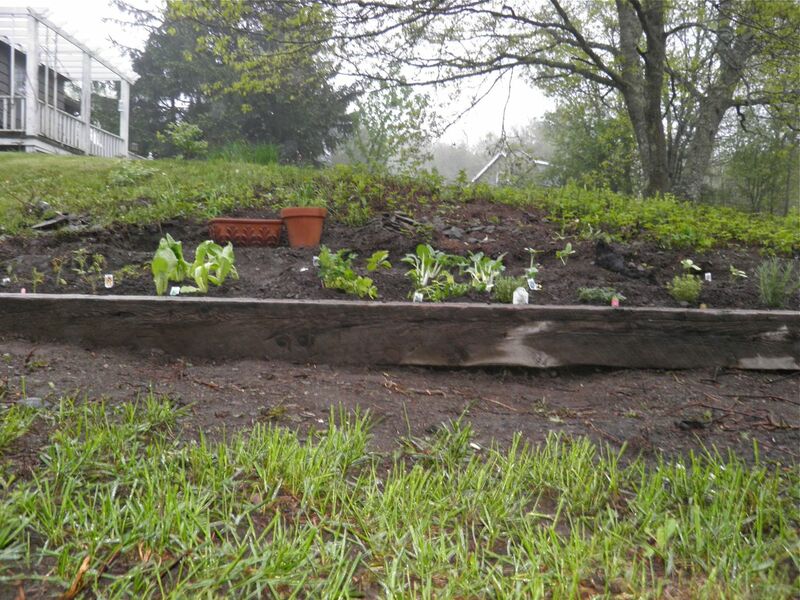 But we did and planted a cheek-by-jowl garden. It’s coming up quite well. We have beans (green and purple), peas (sugar and regular), purple and regular carrots, corn, chard, salad mix, beets and squash (spaghetti and buttercup). It’s fenced in so hopefully will be protected from the deer. Besides the far side yard, the other area that we have that’s sunny is a small hill. In the spring we had used it to burn old wood and some other items we should have gotten rid of quite some time ago. So it was fairly bare to start and begging for green. There’s two ways to plant on a hill. You can either plough it and plant rows, or if you’re into a little extra work, you can terrace it. 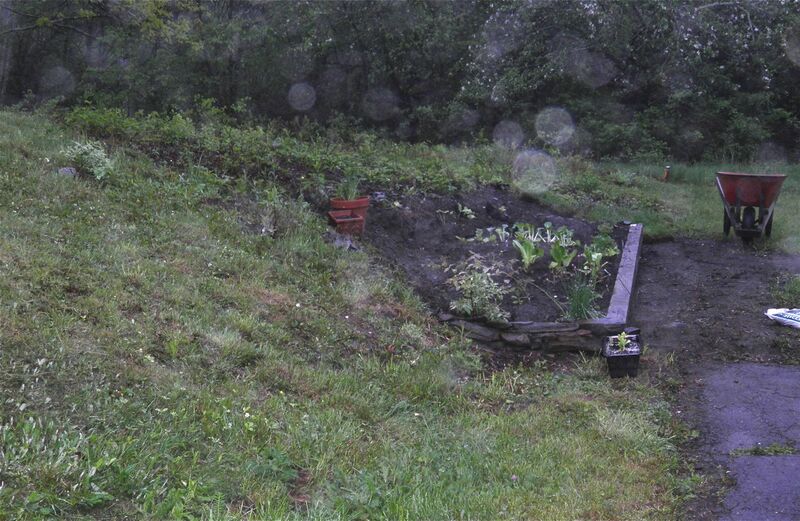 The soil you take from the incline fills in the terraced parts. Just make sure you improve it with manure or other fertilizer. 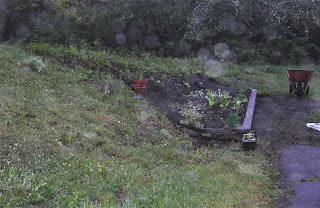 We chose the terracing and started yesterday. We (my spouse actually) were able to put in one tier thanks to a very large piece of wood we had on hand. At least one more is in the works, probably for next year. 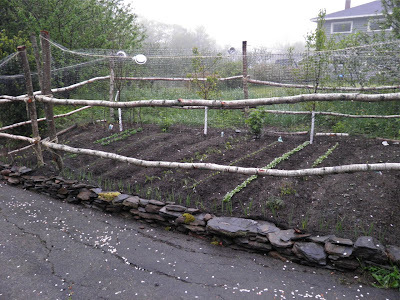 The reason one would chose terrace over rows has a lot to do with what you want to plant. If located in the right area, a hillside can be a micro-climate, giving you the potential for a half a USDA zone increase, or even a full zone, from the rest of your yard. Our hill faces north, but has sun through most of the day. It’s also sheltered. The sheltering is what’s important for those plants that may need a little more special care and warmth. 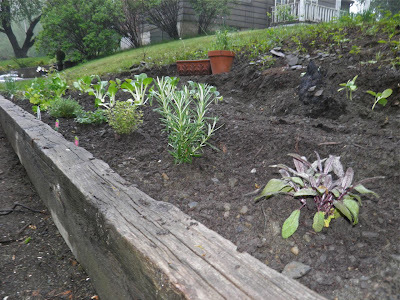 It’s an ideal place for herbs that overwinter outside in Nova Scotia. Some other herbs that we put in our terrace are chives (thanks to a dear friend), mint (thanks again), basil, parsley, Italian parsley and dill. They will all be happy in a warm place. We also put in tomatoes (always heat lovers), lettuce, cucumbers, eggplant and bok choy. All were purchased as plants, so the late-ish date won’t put anything behind as far as harvesting. We filled in some areas with seeds. We'll see how that goes. It will be interesting to see how the creation of a micro-climate changes the speed of growth. Just 20 feet away we have tomatoes as well, so they can be our yardstick. 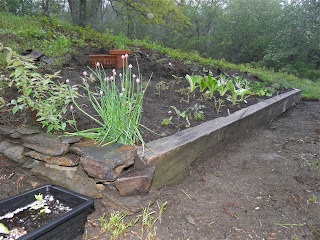 If you have hilly property with sun and want a garden, be it vegetable or flower, think about terracing. Our is just small scale, but a step in the direction of self sufficiency. Hopefully it will give us the boost we need to grow those more challenging plants that like it a little warmer. We may try a watermelon or two, although they probably won't get very big. At the very least I am looking forward to having hardy herbs for many years to come. 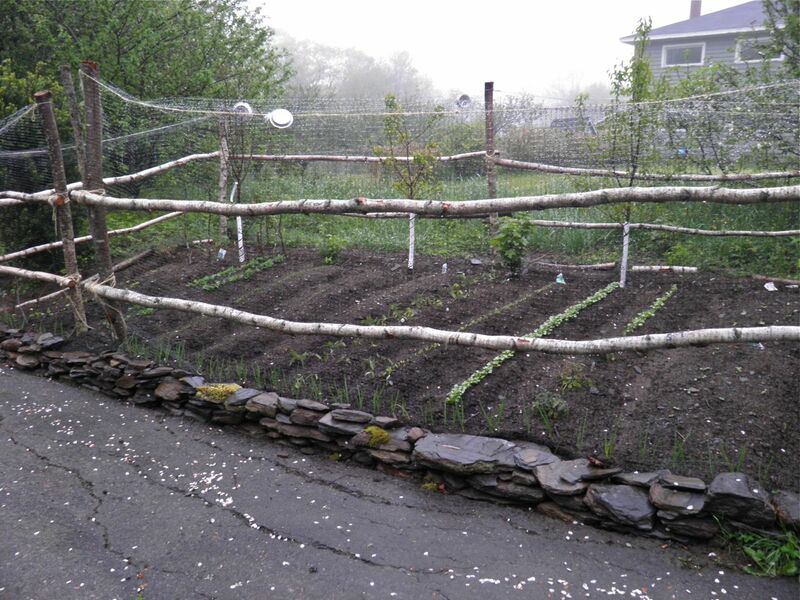 This is our other garden. Everything is growing. It's a good feeling.